We all have our "pet" perfume houses. For me, a "pet" house would be niche, and small niche at that. One of my favorite perfume pets of the last few years has been Zoologist. 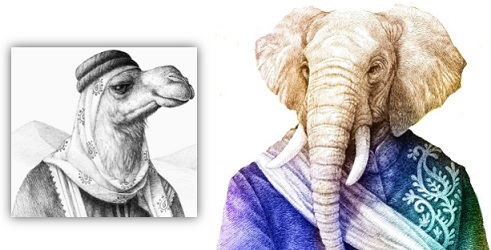 Late this year, two new perfumes have joined the zoo: Camel and Elephant. Each perfume gets inspiration from animals — and places — I love. The camels I've met up close were at the edge of the Sahara desert (I gave the one I sat on a hug and a kiss on its neck, which prompted a jerky head motion and look that said: "What the...?") So, I associate Zoologist Camel with Morocco. Its complex mix of notes reminds me of early-stage Serge Lutens perfumes, but Camel is sheerer. Camel's opening smells slightly medicinal and thick, but quickly lightens with lovely orange blossom and a sugary (but not overly sweet) "crystalline" accord that must be the dried fruits. Next, jasmine mixes with incense and myrrh and I detect a mild clove scent. The musks in Camel smell of pre-deodorant humanity, but these humans burned incense and wore tiny silver cages around their necks with a sticky lump of "amber" inside. Camel presents an afterglow of incense (a quirky ash perfume). I love Camel's base: cedar, vetiver, amber and oud. Camel's extreme dry down, that lasts most of the day, is spicy orange blossom mixing with incense. Camel belongs on my to-buy list. Elephant begins with the vibrant, !GREEN! scent of crushed fat, juicy tropical leaves — it'll perk you up, I guarantee. In mid-development, there's a bouquet of cocoa-dusted blossoms, and a mix of bitter and sweet (white flowers). In the base, I smell "green" patchouli mixing with coconut, raw sandalwood and earthy musk (as in musk made of dirt). Elephant's sandalwood note is surprising and different; it's tart and sappy, a welcome change from the creamy sandalwood I often smell in perfumes. The glorious elephant got its due with this fragrance. If you've ignored the Zoologist line, I say: Give it a try! Apart from today's two fragrances, I can recommend Dragonfly, Bat and Rhinoceros. Zoologist Camel and Elephant Eaux de Parfum are $135 for 60 ml. 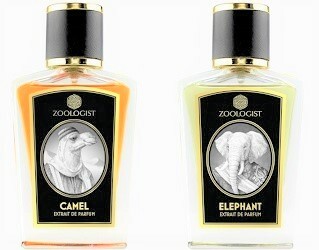 I haven’t tried Zoologist but Camel sounds like my kind of perfume. Might need to break down and order a sample! MMKinPA…they seem to be expanding their distribution so you should be able to get a sample without too much trouble…. Zoologist is one of my pet perfume houses too, thanks for the reviews. Both of these are at the top of my sample want list and I’m trying hard not to blind buy Camel, especially since Zoologist offers those very reasonable travel bottles….but I know from the quirkiness of the line in general that I’m better off sampling first. I got in on a blind split of Elephant, and fortunately, really enjoy it. Great review! I was hoping it would get reviewed here. nancy: glad the split worked for you. Thanks for these reviews, Kevin! I haven’t caught up with the latest three from Zoologist, and have been wondering (in an idle way) what they were like. Nice to get some encouraging news. Thanks for the review, and I promise to remember your recommendations. A few months ago I ordered a small decant of Panda based on the notes. Nevermind that people were enjoying all the *other* Zoologist scents; I made my choice and HATED it. I didn’t hate Panda but in my opinion it was something like Escada made in bright pink bottles years ago. I can wear it though:) Hummingbird and Macaque were way too sweet for me. I almost hated those two. Thank you Kevin! I loved these two as well. Camel reminds me of a Nesti Dante soap from a Chic Animalier line which is called Bronze Leopard (it also has myrrh and dried fruit notes in it. My cat loves to sleep in the sink… So sometimes he smells of the soap and the mix of his wet fur and this soap smell really is intoxicating and deliciously animalic Elephant is like some relative of Phylosikos and Tam Dao in my opinion. I really loved it too for it’s green freshness. Veronika: ha…that’s so sweet. One of my cats also gets residual scents from all manner of things: soaps, candles, ME. He smells delightful…I hope HE thinks so too, since he only gets one bath a year. CAmel sounds right up my alley as a Serge Lutens fan. cazaubon: give it a shot! Thanks for the review. I wonder if Elephant’s Chris Bartlett is the one who runs Pell Wall perfumes (and is also a helpful contributer at Basenotes’s perfumery section). Ah; I wasn’t aware that he’d branched out so widely. As always, thank you for the reviews. Fears, lucky I kissed a kind camel…gotta kiss an elephant next! Calypso, you’re welcome! And “bat in the bathroom!” Was something I experienced many times growing up in Virginia. Zoologist is also one if my “pet” houses. They’re all interesting and quirky. Hummingbird is going to be my Christmas present from Santa. I can’t wait to try these 2 new ones. Sariah, glad to see some fellow “Zoologists” showing up here! I have travel sizes of the whole menagerie! I recently blind bought the most recent beasties – Camel, Elephant, Dragonfly and Panda 2017. I was most looking forward to trying Camel, and I do like it very much, but, as often happens, it isn’t my favourite. That honor goes to Elephant, which I absolutely love! Perhaps the only one that I don’t like is the new Panda, which is much too sweet for me and more mainstream than Zoologist’s other creations. I love the old Panda and wear it a lot in spring and summer. Other favourites include Rhinoceros and Nightingale but I wear them all, even the peculiar Bat and the sweet Hummingbird, which is above my sugar tolerance level, but is so beautifully composed that I wear It anyway. So yes, I’m definitely a fan of this house!